Barton Peveril Sixth Form College is fully committed to equality and diversity. The College actively seeks to monitor, advance and encourage the active participation of all individuals and groups. It fully meets its commitments to equality and diversity legislation and strives to uphold the spirit as well as the letter of the law, celebrating the enrichment brought to the workforce and student population by differences in individuals and groups. positively celebrate and advance diversity and equal opportunities for all our students and staff and governors, either current or prospective, and promote fundamental British values. provide an environment where everyone is treated equally and as individuals regardless of colour, race, nationality, ethnic or national origin, religion or belief, political belief, social or economic class, marital or parental status, gender, sexual orientation, age, disability or any other perceived difference. inspire all our staff and students to help create an environment where everyone feels welcome and confident that they will be treated fairly, that they will be valued as an individual and that their views and opinions will be encouraged. Within the framework of existing legislation, wherever practicable, achieve and maintain a governing body, staff body and student body, which reflects the local community in which it operates. At Barton Peveril, we keep constant and continuous watch on our data. In the academic year 2016-17, male students made slightly less progress than female students, with the gap narrowing significantly compared with the previous year. We are continuing to focus on male progress in the academic year 2017-18. Staff and students alike are working collaboratively to implement strategies and enable male learners to be the very best that they can be. A snapshot of the composition of staff shows us that 7% identify themselves as Asian, 2% identify as Mixed/Black/Other, 82% identify themselves as White British and 3% as White Other. In addition, 6% of the staff have not stated their ethnicity. The committee consists of staff and students who voluntary come together to raise awareness of equality, diversity and inclusion. 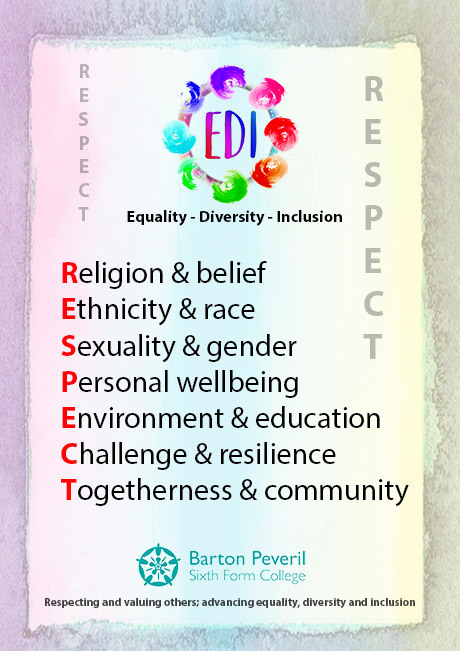 Led by the ED&I Coordinator, they are responsible for taking the lead in developing the equality and diversity and fundamental British values activity across College, including ways in which to advance and celebrate diversity and ensure equal opportunities for all. They also provide advice and feedback to the Senior Leadership Team and contribute to the Equality and Diversity Annual Report. 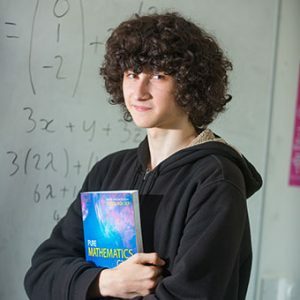 The College’s quality cycle and self-assessment reports monitor student progression which includes focused analysis of various groups within the college. An action plan is produced to address any underperformance.